As we approach the later part of autumn, I have to say it is one of my favourite seasons. With an abundance of fruit and vegetables to harvest, rich autumnal tones glowing through damp days that smell of wet leaves and bark, to the last flush of colour from our herbaceous perennials bringing us right up to the gates of the Winter season. Although many would assume as Summer draws to a close there is less to do in the garden, the opposite is in fact true, between cutting back, dead heading, collecting leaves and dividing plants Autumn is one of your busiest times! So get the waterproofs on and dig in! November is the perfect time to be planting your bare root trees and shrubs, with plants fully dormant and the ground still warm enough – this can be a really cost effective way of establishing a hedge, as bare root plants are relatively inexpensive. Keep the root ball covered with hessian or black plastic up until planting as as soon as roots are exposed to the air they will dry out. Prior to planting soak any bare root plant for 30 minutes, then plant in place with the first flush of roots level with the surface, you should not need any compost or manure in the planting hole, the plant will be happier with the topsoil! Loosen the soil but make sure there are no large air pockets by firming in. Once planted water in well (even if it is raining!) and give a good 3 inch layer of woodland bark mulch around the top of the planting area, being careful to leave a space around the stem to prevent the mulch rotting it. If you haven’t already done so, plant up those winter containers for an evergreen display all the way through until spring. For ideas on which plants to use check out our handy list of the ‘Top Ten Winter Container Plants’. Now is the time to cut back all those herbaceous perennials that have gone over and are no longer looking their best. Cut down to approx. 2-3 inches from the ground to offer the plant a little protection from winter frosts. However leaving those seed heads that are attractive in shape can offer a decorative element over winter, such as Sedum, Hydrangea, Alliums and Teasels – dried seed or flower heads such as these can look beautiful covered in frost and offer the variation in texture that can be absent as the year goes on. (They also look fab if brought in an used in a vase or display). A top November gardening task is the dividing of congested perennials, ornamental grasses and bulbs, this is a great way to split up large clumps and gives you the opportunity for new plants in different areas! Cut back any spent growth then lift the whole clump of bulbs or perennials with a fork, being careful not to damage the roots. Shake of excess soil so that you can easily see the root ball. Bulbs such as Iris can be split with a knife, whereas some larger perennials or ornamental grasses may need to be prised apart using two forks back to back and. Always ensure there is a healthy amount of roots and buds on each divided section, remove any diseased, damaged or dead growth discarding any old growth in favour of the new, young and healthy. Replant as soon as possible at the same depth as it was originally planted – you should not need compost, using the topsoil in the area to backfill and watering in well should ensure healthy growth. Tender bulbs such as Gladioli and Dahlias often do better each year if lifted and stored correctly then re-planted the next year. Once the top growth has died off the bulbs should be cleaned of soil and stored wrapped in a dark dry place that allows air circulation such as in brown paper or straw, store Dahlias in compost. November gardening is prime time for starting to compost this perfect material and make leaf mould! Leaf mould is the ideal compost to use in containers once it has been sterilised by putting on trays in the oven, and you get the benefits of making your home smell like autumnal woodland. Collecting leaves from you lawns, ponds and beds is really important as leaving too many leaves can, create bare patches in the lawn, stop light and oxygen from getting into the pond and smother out bedding plants. Place leaves into a bin liner, moisten if necessary and create a few holes with a knife. Place these somewhere out of the way for up to 2 years and enjoy the benefits of lovely rich compost for your pots! 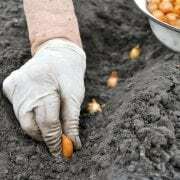 The planting of spring flowering bulbs, such as Daffodils, Tulips, Crocus and Snowdrops is ideally done in November for the best show next year. 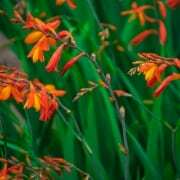 It is also late enough in the year that the risk of many pests and diseases fatal to bulbs such as ‘Tulip Fire’ has passed. For some ideas on which varieties to choose check out our recommended list. Plant bulbs to a depth of three times their height spaced a couple of inches apart, or closer together in pots or for a denser display. 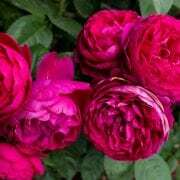 Although the real hard prune for Roses is done in late/winter early/spring, it is a good idea to give your roses a less vigorous prune in November to prevent winter wind rock which can damage the root system or break stems. By removing the longer stems and unnecessary top growth produced during the Summer we create a more stable plant moving forward into the winter, and it also looks a lot neater!